Google powermeter is a free energy monitoring tool that allows you to view your home’s energy consumption from anywhere online. Smart meters are the enablers for the smart grid. The concept of smart grid, nicely described by Thomas L. Friedman in the book Hot, Flat, and Crowded 2.0, is becoming a reality. 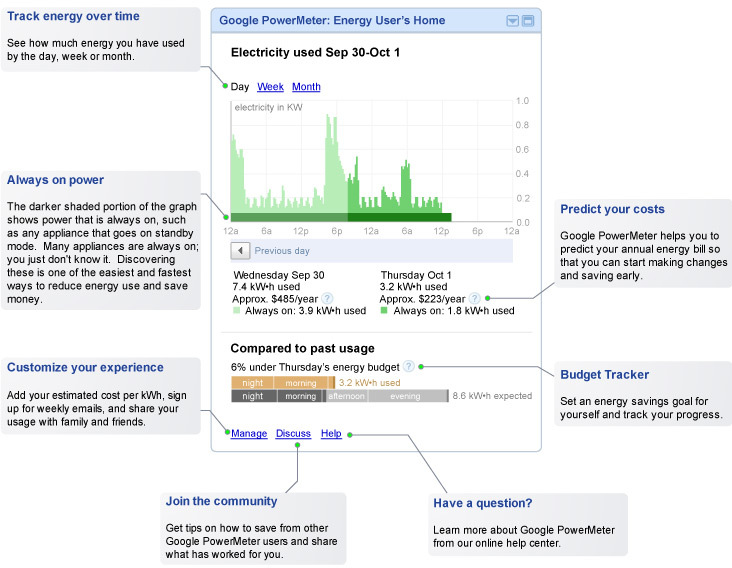 Below one screenshot of Google powermeter, taked from the blog post Energized about our first Google PowerMeter partners. Google introduced the powermeter concept 1 year ago. San Diego Gas & Electric is one of the first utility companies to partner with Google. This month my area will be covered and I will know more about it. From Wikipedia, a smart grid delivers electricity from suppliers to consumers using two-way digital technology to control appliances at consumers’ homes to save energy, reduce cost and increase reliability and transparency. It overlays the electricity distribution grid with an information and net metering system. Companies are working on creating the Database of Intentions. They want to know us, our interests and in a way they are succeeding. Google has been the leading the group. By using Search it knows what we want in a particular moment. Twitter and Facebook added the social part, they know who we know. Twitter at Chirp announced that they target the real-time interest graph. Everybody wants to own people’s interests. As described by John Battelle this is the Database of Intention. And the latest announcement of Facebook demonstrates what’s next, by connecting (some of ) the dots in the Database of Intentions. An interesting evolution to follow. What would be the ingredients for an interesting application or service?